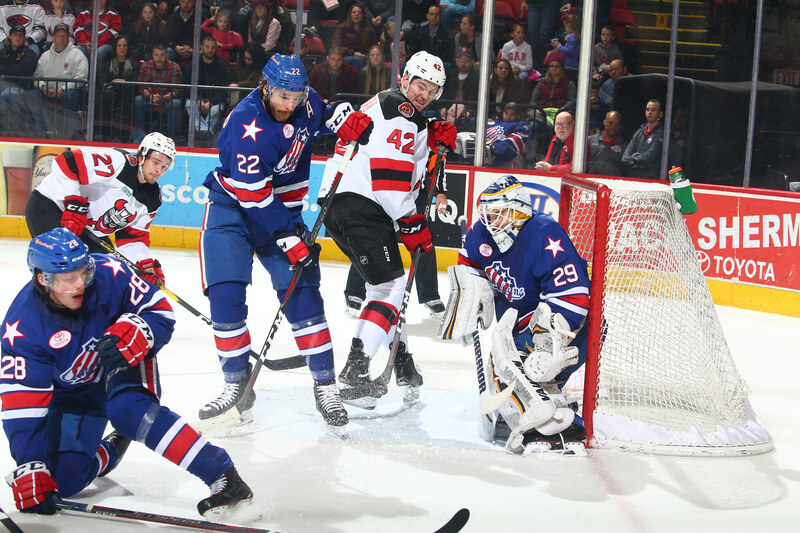 Amerks Bounce Back with a Saturday Night Win · Let's Go Amerks! The Rochester Americans bounced back on Saturday night for a 4-3 win in Binghamton after what the team considered one of the most disappointing losses of the season on Friday. Breaking down the game into three one period games the Amerks won each period and won the game. Rochester came out playing fast in the first period pressuring Binghamton in their own end for most of it. Through the first 13:30 of the period the Amerks had a 11-0 advantage in shots before the Devils finally got a shot on Scott Wedgewood. Binghamton was able to get eight shots to end the first with most of them coming on a power play chance with Will Borgen in the box for interference. There weren’t any goals scored but the Amerks showed up ready to play and it was clear the way they were moving the puck. Zach Redmond scored the first goal of the game and his 13th of the season at 8:19 of the second period. Justin Bailey made a quick move on the board to get the puck to Victor Olofsson in the slot who dropped it off to Redmond who scored from the face-off dot. Someone forgot how to count resulting in a too many men penalty against the Amerks giving the the Devils their second power play of the game. Nick Lappin passed to a wide open Blake Pietila to tie the game 1-1 at 10:39 of the second. Kevin Porter scored with 31 seconds left in the second off of a great back handed pass from Alex Nylander who was skating along the goal line. Porter shot from the slot and scored his fifth of the season. Continuing to pressure Binghamton in the third period the Amerks scored first to take a 3-1 lead at 7:41 of the period. Jack Dougherty shot the puck at the net, CJ Smith appeared to redirect it in front of goalie Mackenzie Blackwood where Wayne Simpson was there to score his sixth of the season. Rebounds, second chances, third chances, and getting in front of the net. Chris Taylor stressed that last season, has talked about it often this season, and when the players are able to do that they score. Josh Jacobs scored an odd and pretty easy goal to make it a one goal game at 10:31 of the period. Scott Wedgewood appeared to make a save as the Devils rushed the net and everyone below the face-off circles appeared to believe the play was dead. The puck sat just outside of the crease and Jacobs cruised in to push it into the net. The penalty kill came up big killing off a double minor call on Brendan Guhle for high sticking with 7:45 left in the third. Alex Nylander scored an empty net goal with 1:59 to play by forcing a turnover at the blue line and skating down ice. Binghamton wasn’t ready to give up and Egor Sharangovich scored 42 seconds later. Rochester pressured Binghamton in the first leading the pace of play, scored more in the second, and killing off a four minute penalty gave them the chance to stay in the game and the game winner from Nylander. The Amerks held on for the 4-3 win to split the weekend with a win and a loss. Scott Wedgewood finished the game with 27 saves to earn his seventh win of the season. Next weekend Rochester hosts Wilkes-Barre/Scranton on Friday and travels to Binghamton again on Saturday night.